And then of course there is the other way of how to bake a potato: As a quick and easy main dish, cooked in the microwave or a steamer. To be eaten with curd, butter or cheese, and perhaps another side dish. Besides that: Potatoes are good for a pleasant saturation, because in addition to the high water content (about 80%), they contain long-chain carbohydrates, ie carbohydrates, which move slowly and steadily into the bloodstream. Indulge in organic potatoes. Since these cannot be fertilized with artificial nitrogen, they develop more flavor during their slower growth. And considering the price, organic potatos will not make you poor. Imported early potatoes aren't necessarily the first choice in the winter. And not just because of the poorer climatic balance. Although they score in terms of their appearance and the thin shell, stored potatoes but often have the more intense flavor. To put it short: It does not matter. Certainly, mealy potatoes get more tender and waxy remain more compact, but the taste is ultimately depending on the potato origin and sort. And the softness of the potato depends also on the cooking time and its size. Bake the potatoes with skin! Most vitamins and flavorings are located below the skin, and the skin also protects the potato during cooking process. Wash the potatoes thoroughly and brush them off if necessary, but be careful that you do not injure the skin. Cut out eyes and dark spots. Prick the potatoes a few times, rub them with salt and a little oil. 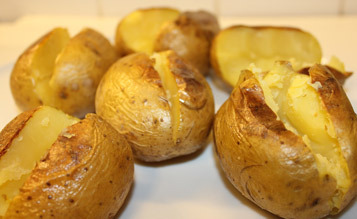 Although baked potatoes are often cooked and served in aluminum foil - avoid this, place the potatoes on a baking sheet. Thus the skin gets crunchy. Put the sheet at a heat of 190°C/374°F / gas level 3 for about one hour in the oven. If you want you can give e.g. rosemary, cumin, garlic etc. to the a baking sheet to add flavor. A baked potato in the microwave won't get crisp, but it goes fast: Calculate about 10 minutes for 400 grams at 700 watts.